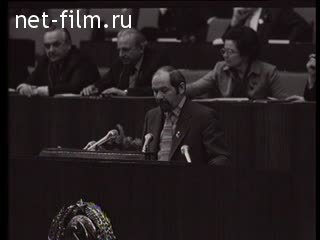 On the third day of the work of the XVII Congress of the USSR Trade Unions. Foreign guests have visited Moscow enterprises. The Congress participants have been greeted by students of vocational schools. The third day of the Congress of Trade Unions. Visiting foreign guests of the production association "gauge" factory "Red Proletarian" electric plant them. Lenin. Addresses Congress delegates, greeting foreign guests, greetings to the students of vocational schools in Moscow. Address maps of Moscow Kremlin. The building of the hotel "Russia» - LS., PNRM. Streets decorated with flags, banners and posters in honor of the XVII Congress of Trade Unions. People in the streets the traffic - different. 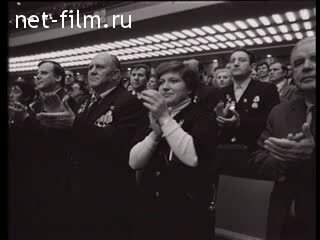 Eliseev astronaut on the sidelines of the Congress - CU. The faces and hands of the workers - CU. Shop factory "gauge» - LS., PNRM. Guests from Hungary at the plant talking to workers - LS. A meeting of Hungarian-Soviet friendship, is the working, listening to different plans. Was the General Secretary of the Hungarian Council of Trade Unions Sandor Gaspar, given to the representative of the plant Banner friendship. Rally at the "Red Proletarian", are: representative of the plant and the chairman of the Federation of Trade Unions of Vietnam Nguyen Duc Thuan. Vietnamese comrades attached to the flag of the Order of Friendship of the plant - MS.
Order of Friendship - CU. Vietnamese and representatives of the plant - MS.
Foreign guests of the congress of trade unions at the plant named after Vladimir Lenin, talking to workers - MS., CU. Rally, foreign guests at the rally. Delivered by the representative of San Marino - CU., MS. The operator at the camera in the hall - CU. Meeting of the XVII Congress of Trade Unions, in a hall of the Kremlin Palace of Congresses are vocational school students with banners - LS., MS.
Students of vocational schools Moscow welcomes Congress (synchronous) - Various. Dedication ceremony best graduates vocational school in the working class appears twice Hero of Socialist Labor, AF Mikhalev (synchronous), the students receives flowers mentors act - different. Delegates and the Bureau applauds.